In 1900, for the first time in years, there were mentions of the synagogue’s activities in the paper — they held a ball to raise money! You can read about those goings-on here. 2/13: The annual Hebrew ball brought together Jews and non-Jews in support of the congregation’s efforts to build a synagogue. 12/27: One of the nominees for the standing committee of the town’s Businessmen’s association was Morris Half. 3/26: “Misses Rose Skirboll, Grace Howard and Miss Young are home from California State Normal. They will return in a few days to attend the spring term.” This is a teacher’s training college in Western PA attended by many young women from Homestead. 6/22: An article listing the 118 graduates of the California State Normal School included a few Homestead girls including Rose Skirball! 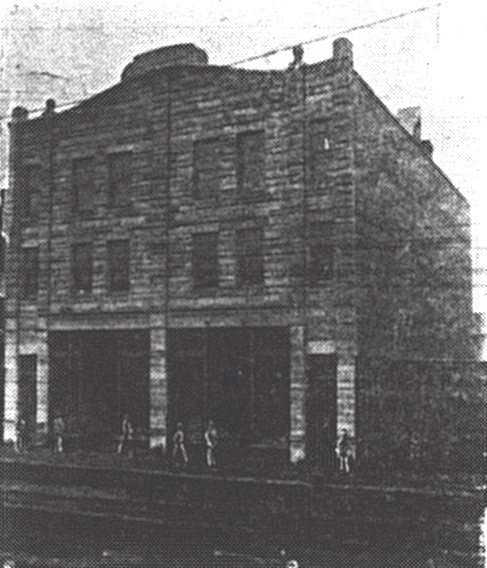 A picture of the Shield Block from the 5/1/1900 paper. 1/4: “Rudolph Half left for Michigan, where he will attend the great Furniture Manufacturers’ Exposition.” The volume of business for their first six months surpassed expectations. 2/26: “Harry Friedman of Philadelphia, has accepted a position as manager of the Philadelphia Bargain store, on Eighth avenue.” This is Samuel Markle‘s store. I suspect they might be related. 4/11: “Julius Schermer, of Bradock (sic), was a business visitor here this morning.” Is this a relation of Reuben Schermer? 5/11: A new jewelry store, Marks‘, opened in the Dupont building, 407 Eighth avenue. 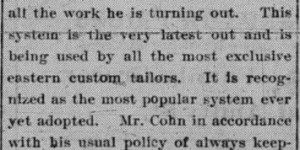 6/28: “Gentlemen who like to dress well who are accustomed to having their suits made to order, will be interested in hearing that Mr. Philip Cohn, of 511 Eighth avenue, is now using the new Madison system in the making of all the work he is turning out.” More on what this is below. 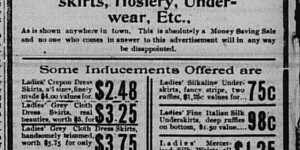 9/15: “Morris Grinberg, of Eighth avenue, has returned from a business trip to the east.” I should hope so! Selichot starts tonight! 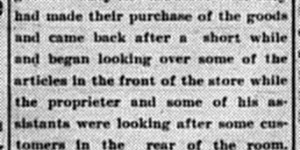 12/24: In an article about how crowded the stores were on Saturday before Xmas, the paper noted, “Everywhere toys were on sale there was a siimlar rush to that in McCune & Swartz, and Grossman, Grinberg and other toy dealers did a rushing business until a late hour Saturday night, and are again repeating a harvest today….Places where unusual large crowds were noticed by the report in making his rounds were…Segelman‘s jewelry store…Wolk‘s Shoe House…Lasdusky‘s dry goods and millinery store…Grossman’s China and toy store, Grinberg Bros. toy and china emporium, Skirboll‘s shoe store, Half Bros. furniture store,” and 8 non-Jewish stores. 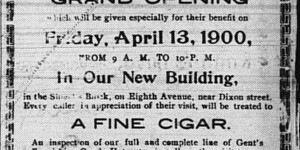 4/6/1900: Ad announcing the grand opening of the new location of Skirboll and Son. 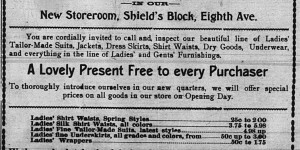 4/13/1900: Ad announcing the reopening of Friedlander‘s store in its new location. 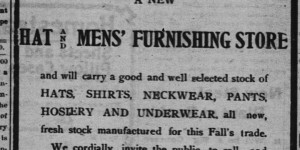 9/15/1900: An ad advertising B. Glueck‘s new men’s store. 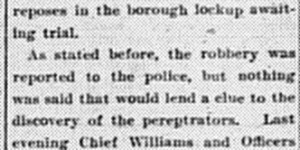 3/12: “Proprietor Samuels of the Bon Ton store Eighth avenue had an experience with shop lifters Saturday night adoubt (sic) 10 O’clock.” Full article below; the version in the Pittsburg Press suggests the proprietor was William Samuels, though a Homestead article suggests Samuel Samuels. 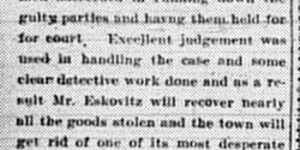 5/14: A strange article appeared about “Adolph Herskovitz, the well-known interpreter” who is the court-appointed guardian of a “ward who is puzzling him” by refusing the marry the man she took out a wedding license with and insisting she marry another. Is this the Adolph Herskovitz who founded the synagogue? The only possible match for this man I can find is someone who seemed to have a lot of official functions. The building on Heisel street occupied by Lewis Beck, as a grocery was nearly burned to the ground early this morning and had it not been for good work on part of members of companies Nos. 1 and 4 the store would have been totally destroyed. A few minutes before 1 o’clock this morning, a woman who was pasing the store noticed flames in the rear part of the building. She informed a man who turned in the alarm and the two companies responded. It required about an hour’s work to completely subdue the flames. 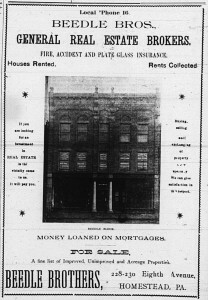 The upper part of the building was occupied by a Slavish family. The loss is about $100, partially insured. 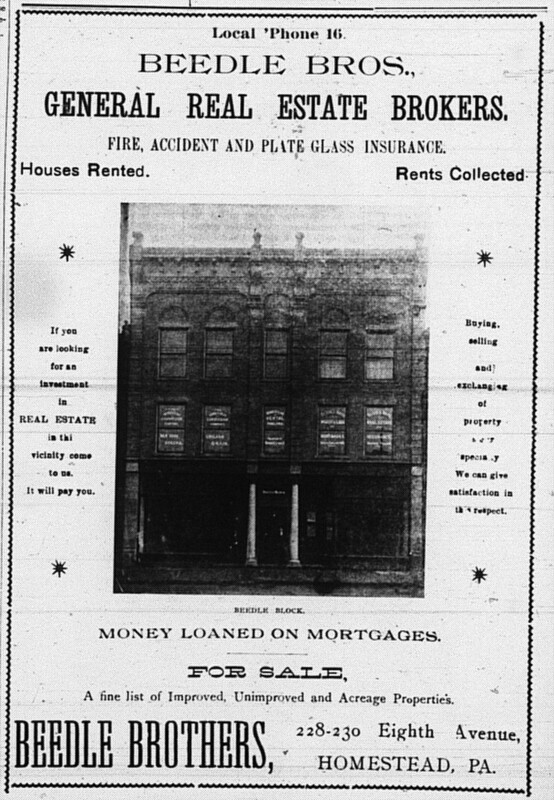 6/19: “The store of Henry Beck, on Heisel street, which was partially destroyed by fire some time ago is being repaired.” They obviously meant Louis Beck. 6/30: “Heran Beck, of Heisel street, opened his meat market this morning. It will be remembered that the place was damaged by fire some time ago.” Again, they meant Louis Beck! For some time past the general merchandise store of R. Schermer, Dickson street, has been the scene of many petty robberies which the proprietor suspicioned (sic) was the work of a gang of small boys who lived on Third ave. Mr. Shermer has at last grew (sic) tired of the happenings and has decided to put a stop to them. Yesterday again several plugs of tobacco and some small things were taken from the store which angered the proprietor so much that he has decided to look the matter up and have the guilty one arrested. Suspicion has been directed against three boys of Third ave. and yesterday afternoon Mr. Schermer went before Justice Giles and instuted (sic) suit against William Baltzky, John Smith and Frank Zedlak charging them with larceny. The boys were placed under arrest this morning by Constable Cavanaugh and will be given a hearing this evening before Justice Giles. 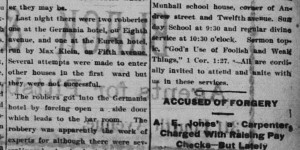 9/1/1900: A robbery at Max Klein‘s Eureka Hotel! 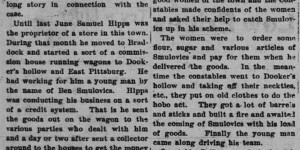 12/21/1900: A sting operation to capture an employee stealing from Sam Hipps. 2/1: “Henry Markowitz is applying for wholesale liquor license on Heisel street.” Probably a typo?! 2/26: The applicants for retail license include only Max Klein at 110 & 112 Fifth avenue. On 4/10 the paper reported he got it. 3/19: Applicants for wholesale license included Henry Moskowitz, No. 524 Heisel street, and Israel Rosenbloom, No. 228 Eight avenue. It does not appear either succeeded. 10/5: In a legal notice regarding the Beech Alley Sewer to run between City Farm Lane and McClure street, one of the people assessed was Samuel Markowitz, who was responsible for 48′ at $22.86. 1/5: Philip Cohn’s son had an accident that turned serious. Not all of the article is legible. And this “little son” was then 15! Fall Caused a Little Son of Philip Coen to Undergo an Operation. Charley, the little son of Philip Coen, the Eighth avenue tailer is in the West Penn hospital, where it is expected he will be put under an operation today. The little fellow while —ing one day early last week fall and bruised his leg just below the knee. The injury seemed slight and did not inconvenience him any at first, but a few days later it began to give him great pain and he was unable to walk. A physician was called in and found the bone had been bruised and —d began to decay and advise that the boy be sent to the hospital as an operation would be necessary. The little fellow was taken to the hospital Wednesday. It is not thought that the operation will prove serious, and the doctors hope to restore the boy’s limb to its normal condition by simply scraping the bone. 1/29: “Willie Skirboll, of Eighth avenue, while boxing with his brother Saturday forenoon, slipped and falling against a shoe machine, cut a pash (sic) in his forehead above his right eye which required two stitches.” Nice way to spend Shabbat! 3/10: Mrs. Joseph Lasdusky, of Eighth avenue, is lying seriously ill at her house. 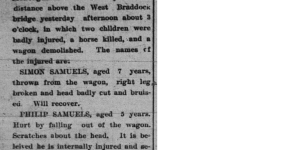 SIMON SAMUELS, aged 7 years, thrown from the wagon, right leg broken and head badly cut and bruised. Will recover. PHILIP SAMUELS, aged 5 years. Hurt by falling out of the wagon. Scratches about the head. It is believed he is internally injured and serious result are feared. The loss of Mr. Samuels will be about $150. 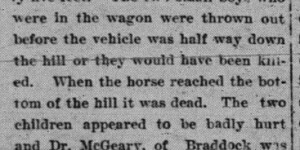 He had only recently purchased the horse and wagon. 4/16: “Morris F. Devay, of Cleveland, O., was the Easter guest of I.S. Grossman, of Dickson street.” By Easter I believe mean Passover, which they called the Jewish Easter (see below). 4/16 was the day after the second seder. There was an M. Devay who was brief a member of the shul around the time the first building was built, but I can find very little information about him. Is this the elusive man himself, checking out his future home? 4/30: Here is an exciting bit of personal news — though the article does not fulfill the subhed’s promise of a wedding feast?! Combined With a Wedding Feast. I.S. Grossman‘s new home, on Dickson street, was dedicated yesterday with ceremonies that were elaborate in every respect. There was a large crowd of friends of Mr. and Mrs. Grossman present at the dedication which was conducted by Rev. Sivetz of Pittsburg. It was noon when the exercises were started and after the dedication a royal good time was had by all present. The afternoon was spent in different kinds of amusement. Vocal solos by Miss Margaret Conroy, The Misses Sober, and Miss Elliot, of Pittsburg, were enjoyed by those present. Dinner and supper were served by the host and hostess. The guest list included the following: H. Moskovitz, Jos. Lasdusky, Sam Moranz, Capt. Ackard, N. Eskowitz, M. Fogel, J. Katz and family, and Miss Margaret Conroy, of Homestead, Mr. and Mrs. Grossman, and son Joseph, of New York, M. Gross, J. Reich and family, William Simon and family, and Rev. Sivetz of Pittsburg. H. Amshel and family, L. Amshel and family, and M.F. Devay and family, of Braddock. 5/9: “Mr. and Mrs. Jos. Grossman, of New York who have been visiting their son, I. S. Grossman, of Dickson street for the past two weeks returned home yesterday.” Weirdly this article and the previous do not mention I.S.’s brother I., who also had a store in Homestead. 7/24: Rev. 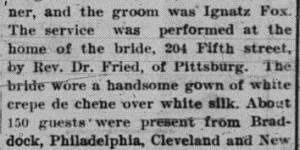 Levandorf, of Heisel street, is the happy father of a bouncing baby boy.” This is interesting, since in May the paper reported the synagogue’s rabbi was Bierman. 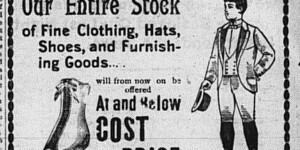 “Noah Cohn, of Muskegon, Michigan, is the guest of his brother, Philip Cohn, the Eighth avenue tailor.” Philip lived in Michigan before he came to Homestead. 10/11: “David Skirboll, of Eighth avenue, is in Philadelphia. He will likely accept a position and remain permanently in the Quaker City.” 10/30: “David Skirboll, has returned home from a visit of several weeks in Philadelphia.” So, nu? 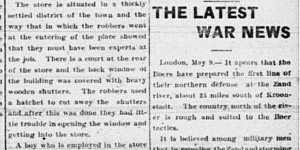 5/9/1900: Nathan Eskovitz‘s store is robbed! 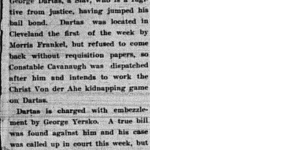 5/10/1900: The robber is discovered. 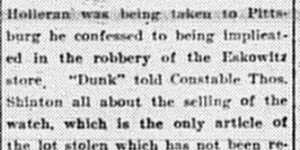 5/10/1900: The robber names his accomplice. 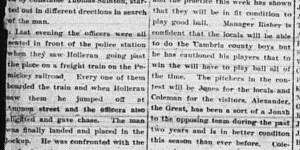 5/11/1900: The policemen are praised. 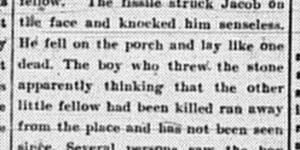 7/17/1900: The first half of the article about the terrible accident that befell Isaac Samuels‘ boys. 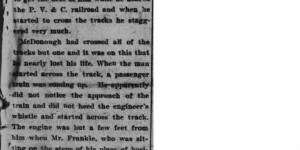 7/17/1900: The second half of the article about the terrible accident that befell Isaac Samuels‘ boys. 10/11/1900: Morris Frankle saved the life of a very drunk man! 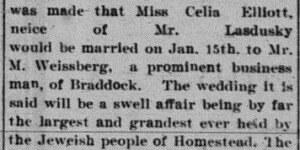 12/4/1900: The wedding of Esther Blattner and Ignatz Fox was written up like a society wedding! 2/7: “The Hebrews of Homestead believe they are becoming numerous enough in Homestead to make their power felt in politics if they stand united, and with this end in view they have decided to form themselves into a political club. A preliminary meeting was held last night and steps taken toward forming a permanent organization. Another meeting will be held the latter part of this week when officers will be elected.” Surely some of the impetus was what their friends in Braddock were doing. Also probably this news item from 1/30 gave them pause: “The politicians will now do some hustling around to find who controls the 60 votes in the Polish political club and try to line them up for their favorite candidate. Sixty votes in a bunch is worth going after.” The election season was then in full swing and getting a tremendous amount of attention. 8/3: “Herman Weiss, a Hebrew aged 35 years died in the County home, Woodville yesterday afternoon. He had been an inmate of the institution for some time and before his entrance there, boarded on Heisel street. Weiss came to this county 18 months ago and has never had good health since. He has no relatives in this country but is survived by a wife and five children in Hungary. The Homestead Hebrews decided to bury the man and to-day the remains were brought here and interred in the Jewish cemetery near Homeville.” For some reason this was a big deal; it was reported in the Pittsburgh papers as well. 12/10/1900: A very long article about Chaukah observance and history. 10/9/1900: A super-long article about Sukkot. 10/9, 12/10: Long articles about Sukkot and Chanukah appeared with general information about the holiday and nothing specific about the local community. I can’t help but wonder if they got this information from somewhere else?! I wonder if the increased coverage of the Jewish holidays correlates with the increased activity of the Jewish community. Their annual ball which started this year or possibly 1899 certainly helped to raise the community’s profile, and the rising number of Jewish merchants required educating their customers on when their stores would be closed. 10/11/1900: A picture and brief bio of Mme. 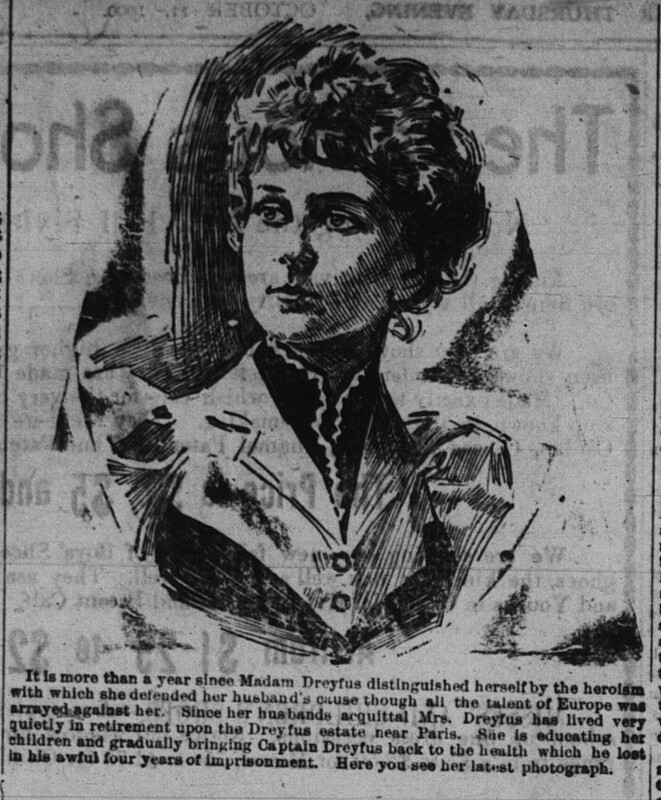 Dreyfus, wife of the subject of the Dreyfus affair. 8/3: “At present she is in Paris, taking in the fair and learning the French language,” the mother of Emma Goldman is quoted in the paper. 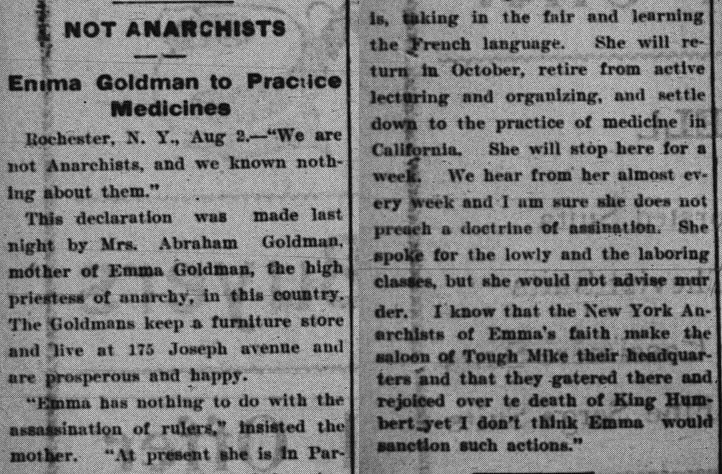 She goes on, “She will return in October, retire from active lecturing and organizing, and settle down to the practice of medicine in California.” Anyone who knows anything about the career of Emma Goldman knows that nothing of the sort ever happened! Emma Goldman’s connection to Homestead originally came during the strike, when Alexander Berkman, with her support, attempted to kill Frick. She returned Homestead after the strike to support the workers, mostly recently, I believe, in 1898. 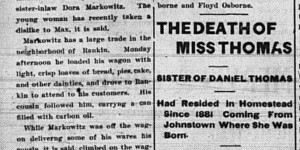 8/3/1900: Emma Goldman’s mother was about to have her hopes dashed.